Time-lapse monitoring of embryos and their development as the latest breakthrough in IVF. Time-lapse technology basically involves as a series of 5000 or more snapshot images, which are then fast forwarded to provide a video-sequence of the embryos developing. You may have seen this on natural history programmes where it is used to show a plant growing of flower blossoming. The systems of microscopic monitoring are the newest development in the field of Assisted Reproduction and are expected to provide important information and answers for the embryo development and the possibility of embryo implantation in IVF programmes. And this is because they monitor and record the development of each embryo 24 hours a day! It is like there is a microscope inside the incubator watching night and day the development of each embryo separately. The embryos are not exposed to external lab conditions. Therefore, there is constant culture and incubation achieving the maximum of quality for the developing embryos. if each cell was divided properly, as well as other very important details that complete the puzzle of each embryo. It is worth mentioning that these details were impossible to record with the traditional ways of monitoring of the embryos. Embryos containing the incorrect amount of chromosomes in each of their cells (known as aneuploid) may divide abnormally even though they look normal to the naked eye. Embryologists will grade embryos on the number of cells, their shape, level of fragmentation, thickness of the outer shell etc. Without embryo monitoring equipment embryologists may assess an aneuploid embryo to be normal and decide that it is suitable for transfer. But, of course, it may not be normal. If it is abnormal, it may not implant or may lead to a miscarriage. With embryo monitoring, an embryologist has lots of information on how the embryo divides, what it looks like whilst dividing etc. This information can be used to assess whether a normal looking embryo is indeed 'normal'. Time-lapse embryo monitoring can also sometimes determine early on which embryos are most likely to make it to the blastocyst stage. This may mean that we can transfer embryos earlier in the knowledge that the best ones have been chosen. Embryos grow slowly and the technology is perfect to observe them in a laboratory environment over two to five days. Selecting the right embryos. 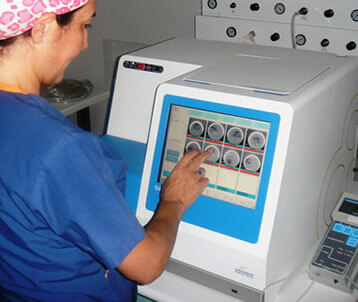 Single embryo transfer (SET) is the predominant procedure as in many other countries, which makes techniques for selecting the most viable embryo even more important. Primo Vision gives detailed information on the development of embryos over time and, together with the Arpit Test Tube Baby centre’s experience, provides increased support in selecting the embryo that is most likely to implant and result in pregnancy. Using Primo Vision Time-Lapse Embryo Monitoring System inside your incubator provides maximum safety in your culture environment. The system allows you to observe all embryos without the disturbing incubation conditions or altering your daily routine. The Primo environment is free of any kind of electromagnetic field effect, the embryos are not moved and outstanding quality images are captured with minimal light exposure by Hoffmann modulation contrast. The Time-Lapse technology enables to objectively assess embryo development in order to transfer or freeze the best quality embryo and to increase your chances of becoming pregnant.